Bookshelf speakers are a very important part of your home theater or media surround setup. These portable stereo speakers do not take up much space and can easily be integrated into most existing setups. With many different brands and models on the market, it may become tricky to find out your perfect pick. This guide about the best bookshelf speakers under 2000 dollars has been compiled to help you make your decision if money is not so much of a concern to you. Right below are the best bookshelf speakers audiophile of any level would surely love. The KEF LS50 is the true winner of the best small hi-fi speakers for a quality audio experience. The speaker has such a rich tone and sound performance that most other speakers within and outside its price category would struggle to beat. Although it also has one of the best designs you’ll see among the best bookshelf speakers, we seem to love the LS50 more for its sound quality and excellence. The bass may lack tautness and mids can lose definition at higher volume although these variations in quality do not come close to taking the shine away from this great speaker. According to Sound & Vision Magazine, the SVS Ultra is the best bookshelf speaker of the year and this is what a lot of audiophiles already know and accept too. Even though you’d have to spend quite a fortune to get some of the best small hi-fi speakers for quality sound output, the SVS Ultra still retails at a price that can qualify it as one of the best budget portable speakers. With a top-notch audio output and design to match, the SVS Ultra shares the top spot of the best bookshelf speakers with the KEF LS50. The Venere brand of speakers are aimed at combining luxury and performance together and the Sonus Faber Venere 2.0 has been a success as far as that is concerned. The cabinet features a traditional lyre shape a front reflex port that has been optimally positioned to sound great no matter its placement within your audio setup. Our next feature of the best bookshelf speakers happens to be the controversially-designed JBL Studio 530. Although a lot of audiophiles are split between whether or not the design is a hit or miss, everyone is on the side that the performance is top notch and hard to beat. Its use of a PolyPlas woofer cone along with an SFG magnet provides a great audio output with enough depth and life-like performances. The Audioengine HD6 has a performance and design that the company chose to call ‘retro forward’. To be honest, the design is retro at best and you have the options to choose from a finish of cherry, walnut, and black. The forward part is a recognition of the fact that this powerful speaker features in-built mono-block power amps of 75W each, RCA, Minijack and Optical inputs as well as high-quality aptX wireless Bluetooth streaming. 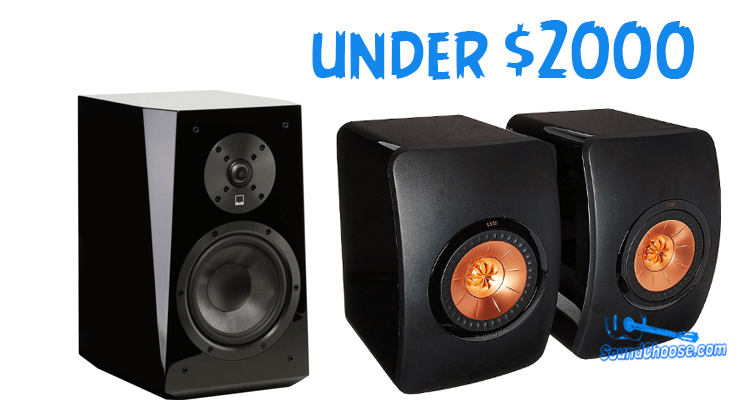 The best bookshelf speakers come with a whole lot of advantages but you may have to advance higher on the price ladder to enjoy the best of surround sound offered by the best bookshelf speakers. These small portable speakers reviewed in here will add flavor and significant audio upgrade to your setup if you don’t mind the cost. When you have to set up your home’s audio system, the best small hi-fi speakers will no doubt be an important part of audiophile home speakers requirement. With that in mind, careful examination and assessment of reviews such as this above will help you ensure you do not get stuck with a sub-par speaker. Any of the best bookshelf speakers under $2000 above will do great justice to your home audio setup.